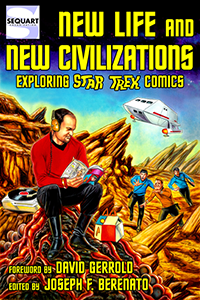 Sequart Organization is proud to announce the release of New Life and New Civilizations: Exploring Star Trek Comics, edited by Joseph F. Berenato. New Life and New Civilizations: Exploring Star Trek Comics examines the long history of Star Trek in the four-color realm, featuring insightful essays from popular Trek comic scribes and novelists, as well as other subject-matter experts. After almost 50 years, the human adventure is still just beginning — find out why Star Trek comics have not only lived long, but prospered. The book features a foreword by David Gerrold (author of “The Trouble with Tribbles”) and a cover by Patricio Carbajal. 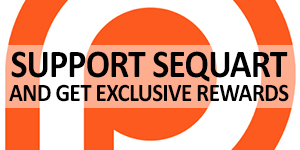 It runs 304 pages and is available in print and on Kindle. You can read more on the book’s official page. Tagged David Gerrold, Joseph F. Berenato, Patricio Carbajal, Star Trek, Star Trek (Abrams continuity), Star Trek Week, Star Trek: Countdown, Star Trek: The Animated Series, Star Trek: The Next Generation, Star Trek: The Original Series. Bookmark the permalink.